Join the discussion on our forums! 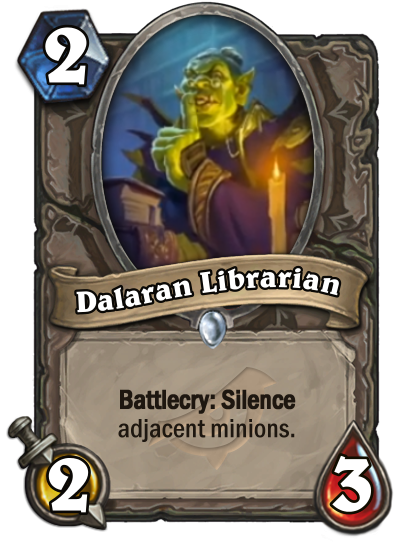 Come discuss Dalaran Librarian over in our dedicated Dalaran Librarian discussion topic. Don't make her raise her "shush"! Turn 4 Soldier of Fortune, turn 5 Arcane Watcher + Dalaran Librarian. I like this. Saronite Taskmaster and this for pure aggression. Cool card but they were showing it off in Priest which is where it shines but I don't see any other classes using it.